The moon was full last night, and I lucked out on weather — as expected. It’s been a weird winter. 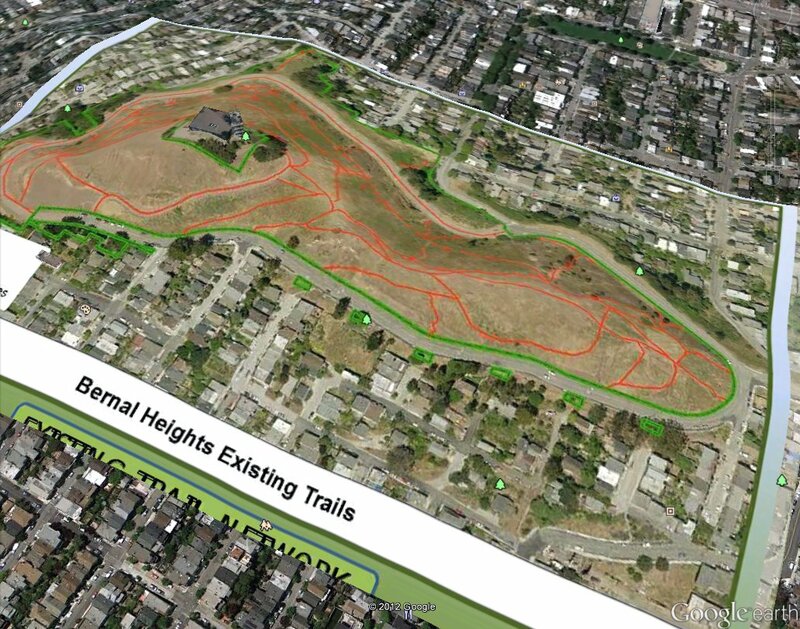 San Francisco Rec & Parks has posted notes from the last community meeting about trail restoration on Bernal Hill. 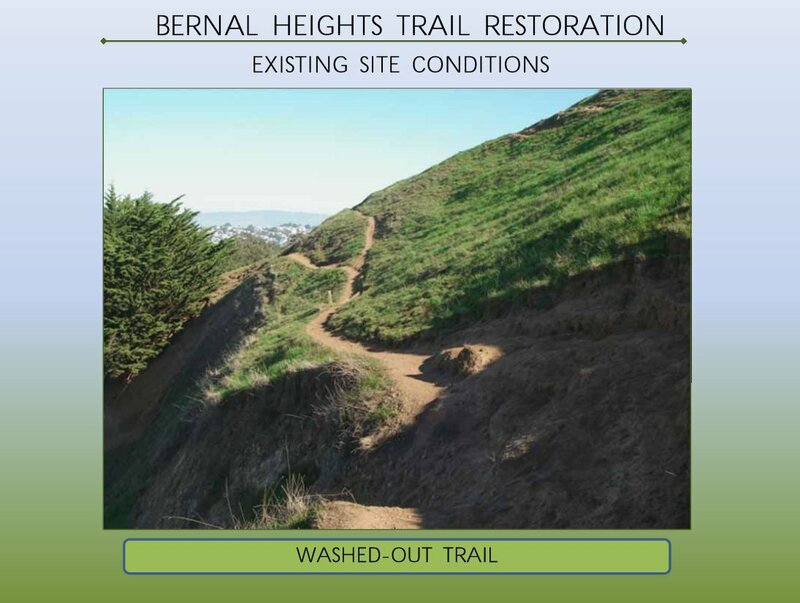 Of particular interest is the presentation with a map (on page 41) of their “Concept Plan” for the trails. 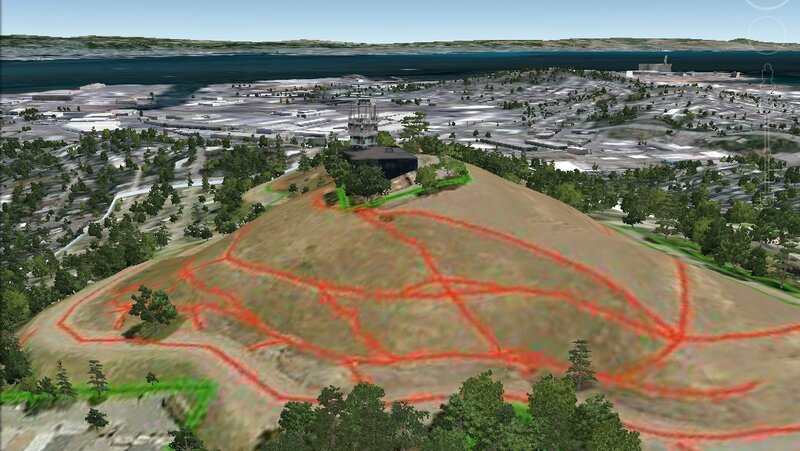 Several neighbors at the meeting remarked that it was difficult to visualize the lines on the map as actual trails, and one neighbor suggested that the proposed changes be marked in chalk on the hill so that folks could see them in context before the next (and last scheduled) community meeting on April 4. Above is Rec & Parks’ map of the existing trail network. 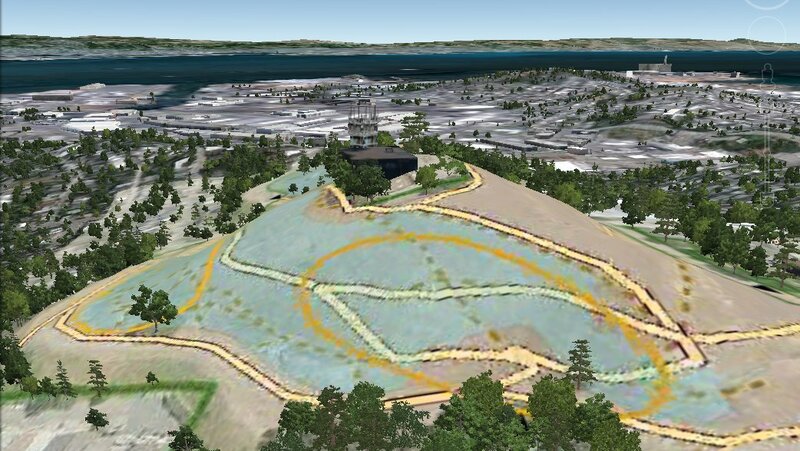 And this is the concept plan they brought to last week’s meeting. 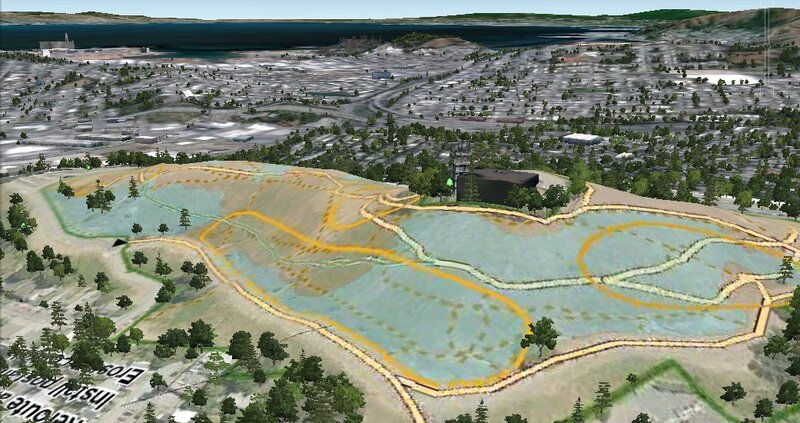 Google Earth’s terrain elevation model isn’t perfect, but I think it’s useful enough here, especially if you already know the contours of the hill, and are just trying to visualize the proposed changes in context. The post and rail fencing is intended to keep people and dogs from clambering up the steep, erosive slope. None of this is set in stone. 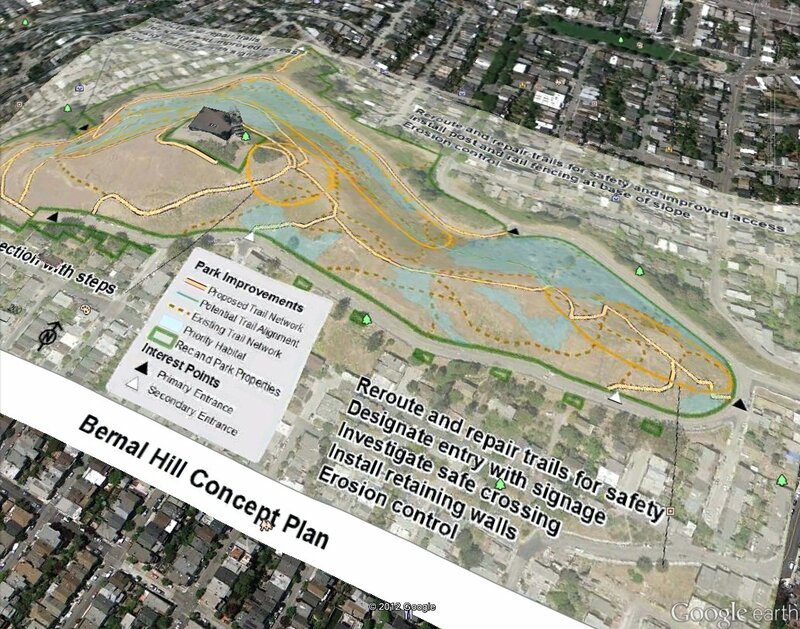 The Rec & Parks folks took down a lot of suggestions at last week’s meeting, and I believe they said they’d try to post an updated plan before the next meeting, April 4. 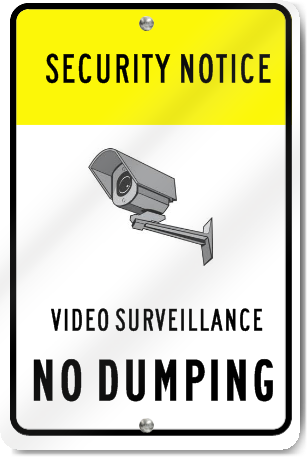 We did put up a “no dumping sign,” and it has helped to a point. 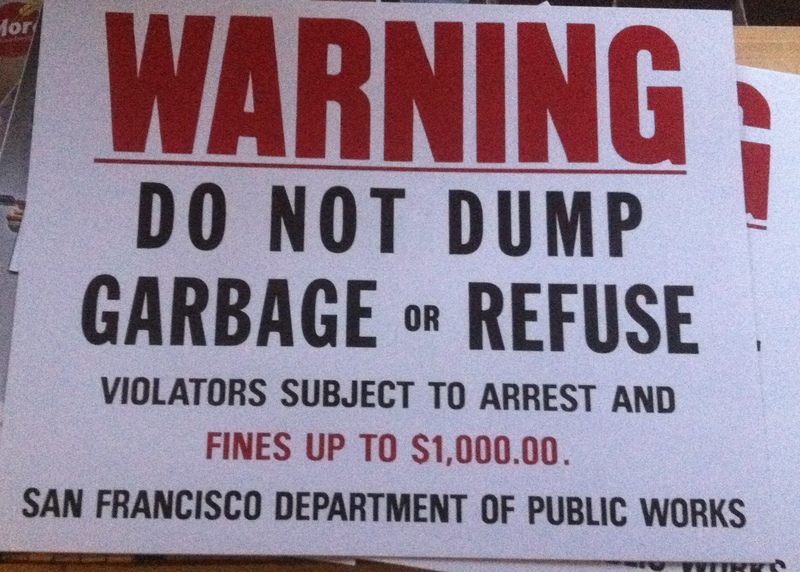 You can actually call 311.org and they will send you the standard SF department of public works “no dumping” sign. However, it’s on you to install it. I would suggest a t-post with a t-post driver. Lowes sells flat pieces of sheet metal that you can stick the sign to. It’s probably about 15 minutes of actual work to put together. Sure enough, I called 311 at 1:37 on a Friday afternoon, and DPW dropped them off on Saturday at 1:32 pm. So that’s pretty good service. The signs are printed on adhesive-backed plastic, about as thick and stiff as poster board. 11" x 14" signs drom DPW. Call 311 to get one. DPW will drop them off, but you've got to mount and post them. 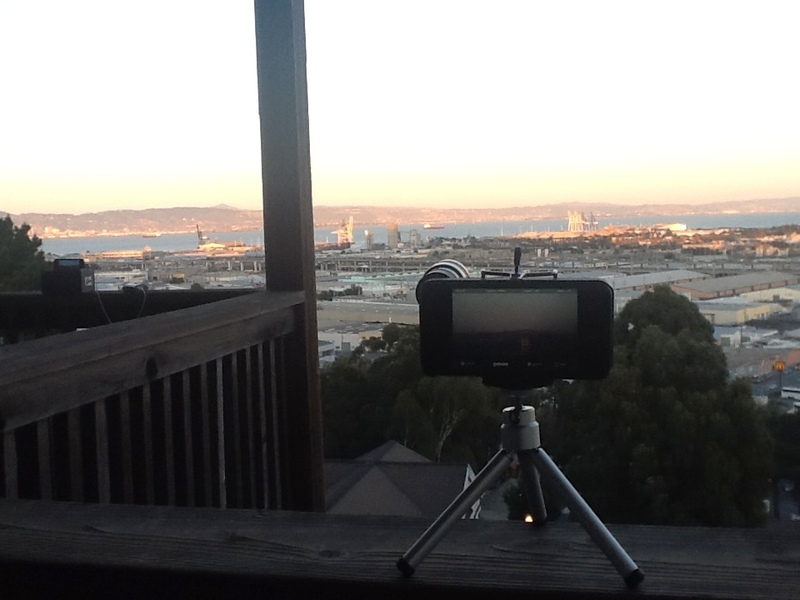 Past pilot studies of utilizing cameras in hotspots proved cost prohibitive with minimal results. Cost prohibitive? Not my camera! It runs for three months on two AA batteries, could be installed in minutes on the notice board at the park entrance, and only cost $11. The only bad news is it’s fake. So my proposal won’t actually catch any dumpers. It might deter some, though. And it’s compatible with a real surveillance system. Think of the $11 notice board camera as a sacrificial decoy. A camouflaged game camera could snap a picture of anyone who tries to disable it, for example. Or an infrared camera higher up the hill could watch over both the notice board and parking area. Is that too Big Brother-ish? Or what’s that other literary reference about the all-seeing eye? Last year, Google bought the historic Pacific Press, site of a former Seventh Day Adventist publishing house, and a Mountain View landmark for over a century. It’s also currently home to an office of Microsoft. It used to be Tellme Networks, but Microsoft bought Tellme in 2007. Now they’re selling off part, but that’s another story. 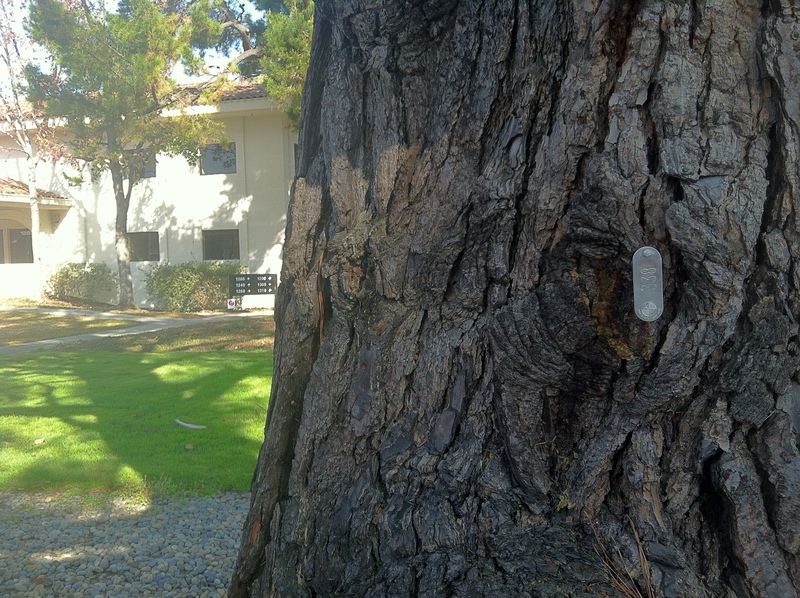 Number tags appeared on every tree in the campus in January, or was it December? So Google is now Microsoft’s landlord here. I’ve worked here since 2004. It’s a lovely little campus, full of trees. There are tall palms and redwoods, side by side. 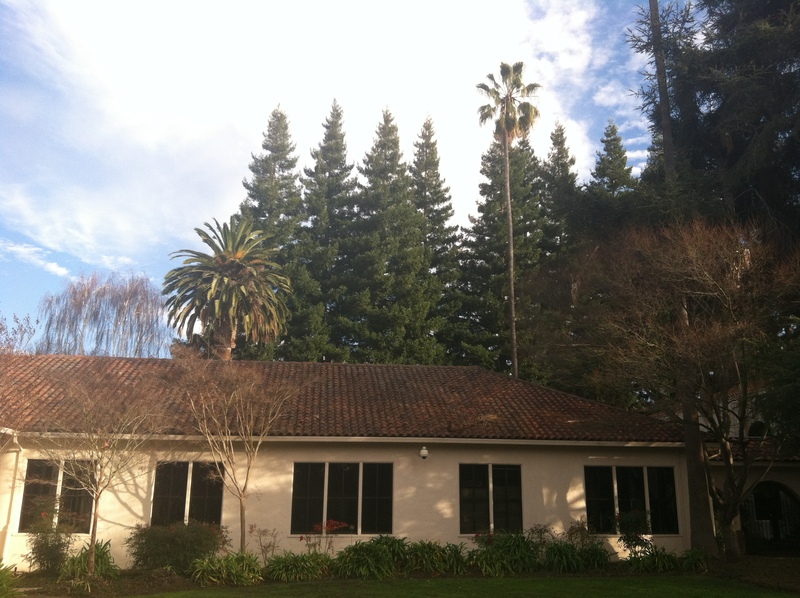 Tall palm trees grow beside redwoods. 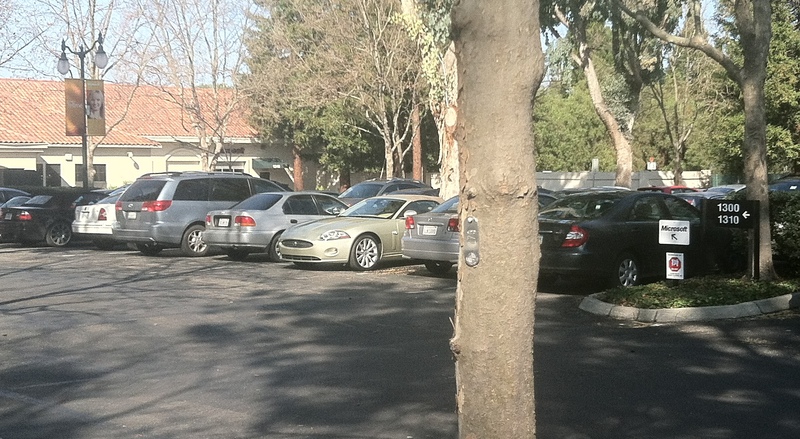 I’m not sure I would have guessed there were several hundred trees, though, before the number tags appeared. Every tree, even the little ones (but not the shrubberies) sprouted little numbered tags sometime in the last month or so. Nearby trees have sequential numbers, so it’s clearly some sort of inventory system. The former Tellme bits that are staying with Microsoft will be moving to Sunnyvale soon, when the lease is up. 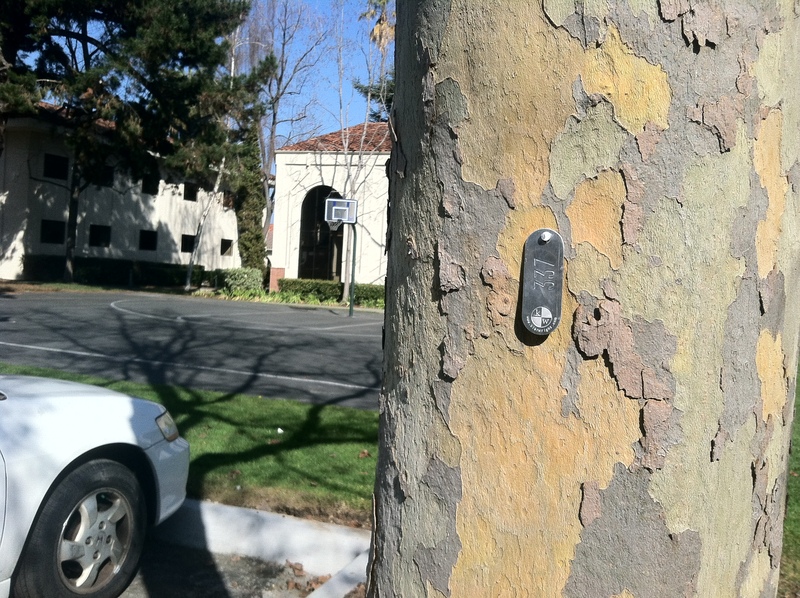 Was Google worried that their tenants were going to abscond with the trees? Inside, work continues as the final months of the office lease count down. 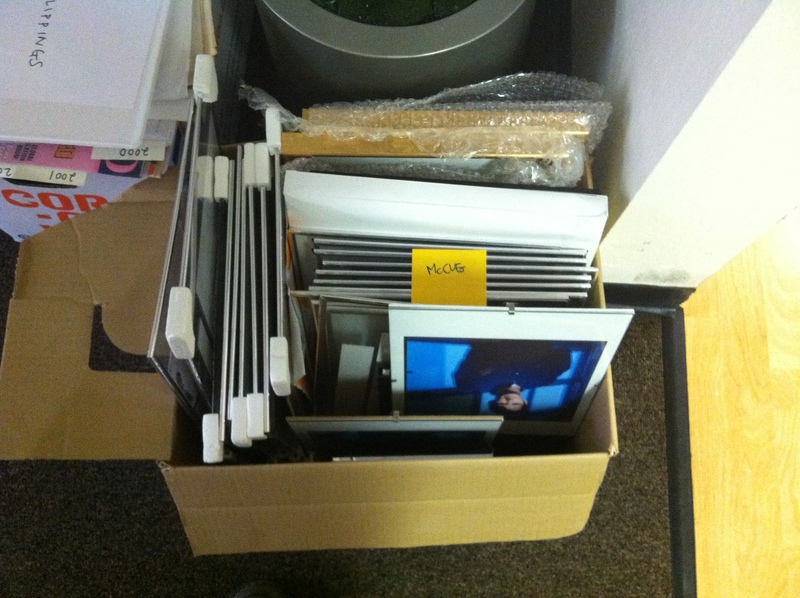 Twelve years’ worth of memorabilia and swag are hauled out of a store room. There’ll be no room for this on the moving truck. A quick pic from out my back door, inspired by a Bernalwood post yesterday. This is approximately the opposite view as the first picture in that post, Bernal looking back at the morning Silicon Valley commuters headed south on Caltrain. See you back in the ‘Wood.